Mercedes-Benz has issued an internal announcement to U.S. dealers (via C450 AMG) that confirms CarPlay will be supported in a number of 2016 model year vehicles starting with December 1, 2015 or January 8, 2016 production or later. CarPlay can be controlled using the central controller or touchpad, if equipped, on supported Mercedes-Benz vehicles. Siri voice commands can be activated by pressing the voice control button on the steering wheel. CarPlay works with compatible iPhones plugged into a specific USB port on supported Mercedes-Benz vehicles, labeled "2" below on the right. 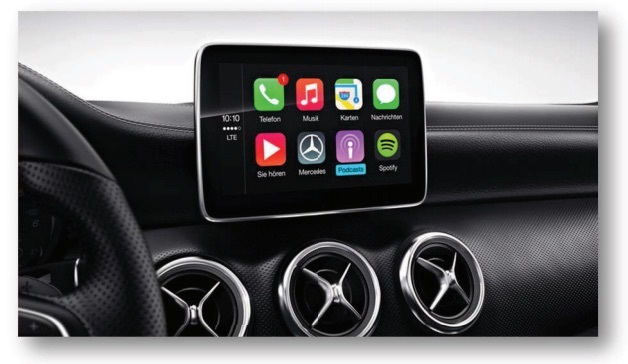 Apple CarPlay® will be a completely different interface than the customary Mercedes-Benz infotainment. The customer will not be able to use the Mercedes-Benz headunit functions at the same time as CarPlay®. For example, use of the Spotify app cannot be done simultaneously with COMAND Navigation. CarPlay is available in 2016 CLA, GLA and B-Class vehicles with December 1, 2015 production or later as a standalone $350 package or "Multimedia Package with Smartphone Integration" upgrade. Apple's in-dash software is also available in the 2016 E400 Coupe, E550 Coupe, E400 Cabriolet, E550 Cabriolet and CLS400 Coupe with December 1, 2015 production or later with the "Premium 1" or "Premium 2" equipment package ($3,650-$4,080). CarPlay is included standard with COMAND Navigation in 2016 CLS550 Coupe and CLS63 S Coupe models with December 1, 2015 production or later, and 2016 GLE400, GLE450 Coupe, GLE63 and GLE63 S models with January 8, 2016 production or later. I just bought a VW with CarPlay. It works really well, better than I expected! Glad I waited for a car with it. It will future proof the infotainment to some extent. Why are we still plugging stuff in? Not sure how. There was never any problem taking a CD from one stereo in car A to a completely different brand of stereo in car B. Same with phones - bluetooth audio seems pretty universal. Whilst it’s a good start, something tells me that down the road we’ll get, ‘Only works on iPhoneX or above running iOSX or above'. Well what exactly do you expect then? A magical processor that evolves over time to becomes faster so you never have to upgrade? It is future proofed because without it he would not receive any updates for his infotainment system and would be very limited. Carplay is the ultimate future proof because it is dependent on his phone and not the car, that means the possiblity of continul updates for the life of the car. "CarPlay is available...as a standalone $350 package or "Multimedia Package with Smartphone Integration" upgrade. Apple's in-dash software is also available ...with the "Premium 1" or "Premium 2" equipment package ($3,650-$4,080)." Looks like an afterthought or perhaps a bolt on iPad. No that's what they look like even without car play. I've always wondered what drove them to the tablet on the dash look it's not appealing in any way. dang that screen is ugly? Is that some kind of mock up..
BMW is so far ahead of every other manufacturer in terms of infotainment technology / software. That LCD in the MB looks like garbage, as does the interior. Replacing the MB system with carplay is probably the right move. Hope carplay includes maps!